What is the Law in Florida When a Golf Cart Injures Someone? Golf carts were originally designed to be used only on golf courses. For many years, their use was limited to privately owned golf courses and resorts. Today, their popularity has skyrocketed and they may also be found operating on certain public roads and within designated golf communities. Many people remain confused about what rules apply in regards to golf cart accident and injuries. On the golf course, they are used by golfers as well as by various other golf and resort personnel to run errands and ferry guests from place to place. People operating golf carts in this way are governed by Florida’s general negligence standards. The driver of a golf cart which causes harm to someone may be held liable and financially responsible for any harm they cause if they fail to operate the golf cart with “reasonable care." What Type Of Injuries Can Result From A Golf Cart Accident? What Does Florida Law Say About Golf Cart Injuries? Golf carts have been found by courts in Florida to be a dangerous instrumentality capable of causing great bodily harm. For this reason, a golf cart owner is strictly liable for its use. This means the owner will be held legally responsible for the negligence or carelessness of someone using the cart with their permission. The owner may be held strictly liable, whether it is a private person, a golf course or private resort. When the driver’s lack of care causes injury to someone, both the driver and the owner may be held legally responsible for the harm caused in the crash. Are Florida Driver License Laws The Same For Driving A Golf Cart? In order to operate a golf cart, the driver must be at least 14 years old. A driver’s license is not required; nor is the golf cart required to be registered with the state, have a license tag or be insured like a car. Golf carts are limited by state law to a top speed of 20 mph. They may only be operated on specially designated public roads and within certain state parks where they are specifically permitted to do so by law. These roads are found within golf cart communities, mobile home parks and on a limited number of other designated Florida roads. They may only be used from dawn to dusk unless equipped with lights, windshield wipers and other safety features. When a golf cart is operated on a public road, the driver must obey applicable traffic laws. Florida statutes prohibiting such things as speeding, careless driving, running a stop sign, failure to yield the right of way, improper turning, and driving under the influence. These offenses may be enforced against the driver, and may be evidence of negligence when the driver’s action causes injury to another person. Florida also recognizes a vehicle similar to a golf cart which is designated as a “neighborhood electric vehicle (NEV)” or “low speed vehicle (LSV).” These are not golf carts as they operate at speeds greater than 20 mph. They are regulated in a similar way as a motor vehicle with requirements including a driver’s license, tag, insurance and standard safety equipment. Does Florida Law Require A Golf Cart To Carry Insurance? Golf carts which are owned by a golf course or golf resort will typically be insured under a commercial general liability insurance policy. The policy would cover an employee of the resort operating the cart in addition to covering the resort’s strict liability as owner of the cart. A golfer driving a golf course or resort owned golf cart will typically be insured by their own homeowner’s insurance policy. Homeowner’s insurance may not always provide liability insurance coverage for injuries caused by a private person using their own cart on a golf course or on an authorized public road. Responsible owners may have purchased a specific golf cart policy which provides liability coverage in these situations. Have You Been Injured In A Florida Golf Cart Accident? 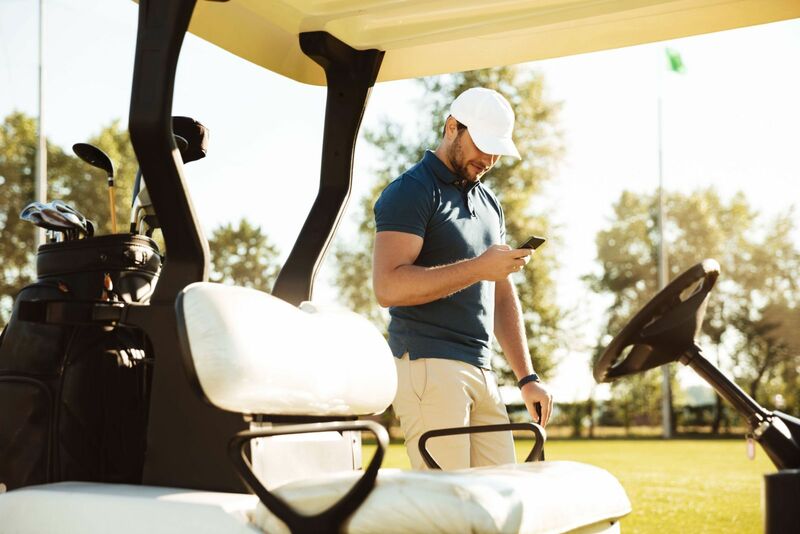 If you have been injured because of the carelessness or negligence of a golf cart operated on a golf course or on the road, you may be wondering if you have a case. We want to make getting useful information as easy as possible. Please contact us online or call our office directly at 888-207-0905 to schedule a free, no obligation consultation. We look forward to discussing your potential claim and your legal rights to compensation. What are the Florida Requirements for Driving a Moped, Scooter, or Other 2-3 Wheel Vehicle? There are specific requirements for driving a moped, scooter or other 2-3 wheel vehicle in Florida. These are different than the rules governing the operation of other motorized vehicles, including motorcycles. These Florida moped requirements can most easily be explained when examining 3 key topics: Licensing, Protection, and Insurance. Licensing requirements for these smaller vehicles are incredibly simple, provided you are not driving on a public street or roadway. Since a moped or scooter is not considered a motorcycle by legal definition, no specific license is required to operate one away from public roadways. On public streets and roadways, you must be 16 years of age or older and hold a regular operator or "motorcycle only" license. This is because mopeds, scooters and other 2-3 wheel vehicles are considered "motor vehicles" on public roadways, and thus require a license. As long as your vehicle has an engine of 50 cc or less, 2 brake horsepower or less, and cannot go more than 30 miles per hour on level ground, you do not need to wear a helmet. Any passengers younger than 16 years old are required to wear a helmet. Insurance is not required for moped, scooter or other 2-3 wheel vehicle operators in the state of Florida. In some cases, you may be required to purchase insurance if you cause a collision on your moped. Personal Injury Protection (PIP) is highly advised if you intend to drive your 2-3 wheel vehicle on public roadways. PIP could help tremendously in the event you are involved in a collision. You may be required to register a moped (but not a scooter) with the county tax collector's office. You will be charged a registration fee and will have to renew on an annual basis. Contact your local department of motor vehicles to ensure that you are following the specific requirements for your particular make and model of scooter, moped or similar vehicle. What are Motorized Scooters and Mopeds? Motorized scooters and mopeds are generally two wheeled vehicles which are registered with the state of Florida, having a gas engine with 50cc or less or 2 brake horsepower or less with an automatic transmission. Mopeds may also be manually pedaled. In order to operate legally, they require at least a class E driver’s license and tag/registration.